I am quite an active person and have completed a few endurance events for charity over the last few years and raised some money for good causes. For me though it was mainly about the physical challenge. This event was different. In 2016 we lost my mum Anne to bowel cancer and my sister’s husband, James, died from stomach cancer. Early in 2017 I decided I had to do something positive in their memory that they would have approved of, and to show support to my dad and especially my sister, who had obviously been through so much. I also knew it had to be tough, as I really wanted to earn people’s support. So I came up with a plan to cycle around Scotland, to places to hold significance to me and my mum. I am a keen cyclist, but my goal to cycle around 110 miles every day for 5 days was definitely the biggest challenge I had undertaken. Without having to ask, my dad offered to act as a support team so I wouldn’t have to carry all my gear on the bike, which made a huge difference. I drew up the route, picked the dates and crossed my fingers for decent weather! I contacted Bowel Cancer UK to let them know what I was planning, and the support and encouragement they provided was immense. They helped me reach out to more people than I could have alone and that really motivated me further. From providing a cycle jersey, organising press releases and genuine appreciation of their volunteers really makes you feel you are doing something worthwhile and significant. When I shared my plans we had an amazing response from family, friends, and strangers alike. Sponsorship from some businesses was greatly appreciated and made it all seem quite official. As the start approached we publicised the event as best we could and I trained the best I could too, although a young family made that difficult! A few longer rides made me feel reasonably confident that I could manage the distance as long as I kept the pace sensible and fuelled myself correctly. Riding 110 miles a day would need at least 5,000 calories each day to keep me going, and make sure I would be able to get out of bed and do it all again. Times five. With my kit all packed and a few willing volunteers from my cycle club in Haddington to join me for the start, we set off from St Mary’s Loch in the Borders on 24th August. In 2014 my wife and I completed a triathlon there, and my mum insisted on coming down to cheer us on, even though she had just recently finished a cycle of chemo. We had decent weather and made the most of it, heading up to Edinburgh and to my university halls where my mum had got a bit emotional dropping me off in 2003. We headed across the Forth and Kincardine Bridges and stopped at Blair Drummond where we spent many impromptu weekends away in our caravan when I was growing up, and ended the day in Callendar. Day 2 took me through the Trossachs and up to Glencoe, Fort William and ended in Fort Augustus. Sounds easier written down but it was a 119 mile day in a lot of torrential rain and so was quite challenging! It was quite warm though which helped, and the scenery was still incredible (when I reminded myself to keep looking around and not just at the road!). Breaking a wheel on the way into Fort William made me especially thankful for my dad’s support, as I got a spare and was back on the road in no time. The third day was an out and back route to Morvich near Kyle of Lochalsh, where we spent a memorable holiday in 1996. Out and back routes can sometimes be more challenging mentally since you are riding away from your destination for half the day. This was definitely worth it as I was able to re-create a photo of my mum from that holiday, and I’ll treasure that forever. The sun was out too! The climb up the East side of Loch Ness at the end of the day was slow going with tired legs, but the feeling you get when you conquer a long, steep hill is really rewarding. The fourth day headed East over to Speyside and would have the most ascent of the trip. I had cycled around there before and knew the ride up to the Lecht ski station would be the big challenge of the day, with 20% gradient. This is where sensible pacing payed off, to make sure I had the energy, and in the end it wasn’t as bad as it had become in my head! We ended the day with old friends in Alford in Aberdeenshire, and ate very well. The last day was the hardest by far. A strong headwind for 110 miles was punishing, especially climbing over Carin O’ Mount heading South. Perspective is the best thing to keep the pedals turning at moments like that. I love riding my bike, and to be doing so to help others with the support of my family and friends is a privilege and it is incredible what you can do with the right motivation. 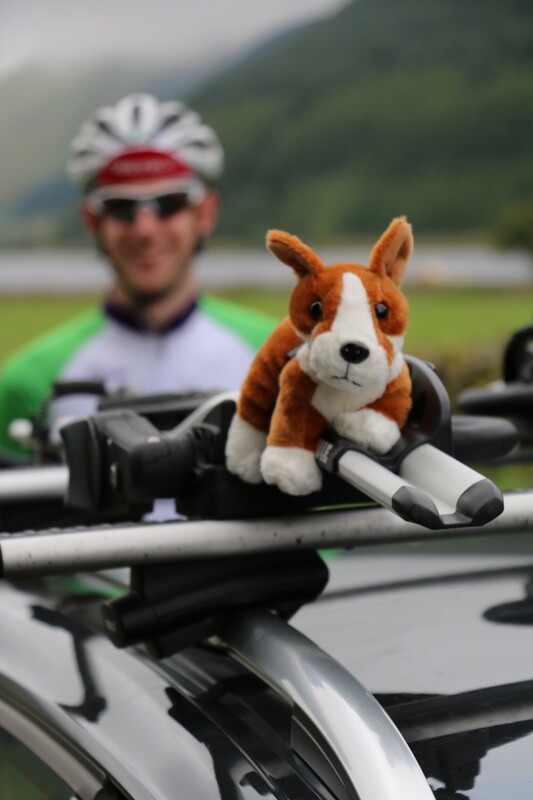 I was happy to have some company from a friend for the last leg down through Fife. We stopped in Leven where my mum grew up and worked as a pharmacist, and her colleagues had put in great effort to fundraise in support of my event. She kept working as long as she could while battling her disease, and the response from the community there was huge and I am so thankful to them all. The last few miles of wind and rain felt like sunshine as I finished at Balbirnie Golf Club in Markinch, where we had an event to bring everyone together. 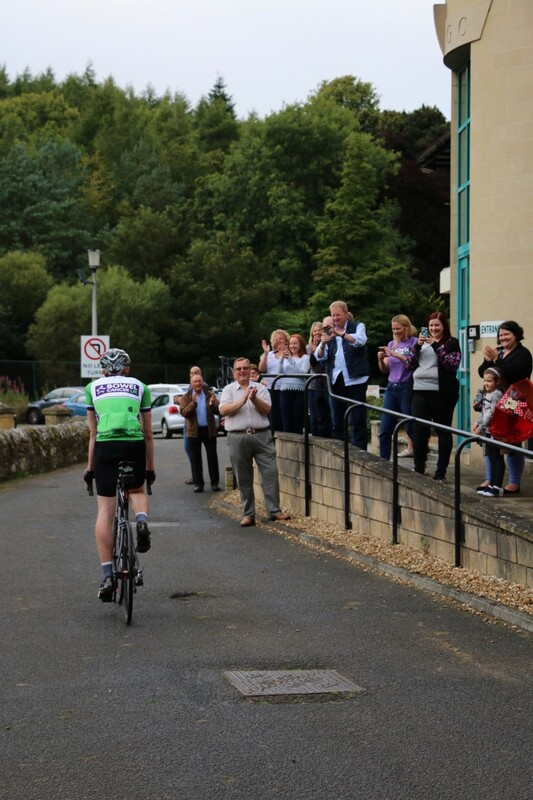 It was great to see everyone there and be able to thank so many people in person for their support, as well as together paying tribute to those that inspired the ride. I am touched by the support of everyone who donated to our cause and helped us raise such an impactful amount for this worthy cause. On paper it was the hardest physical challenge I have ever done, but the determination to finish and pay back all the support everyone had given me means it was never a struggle to keep going. 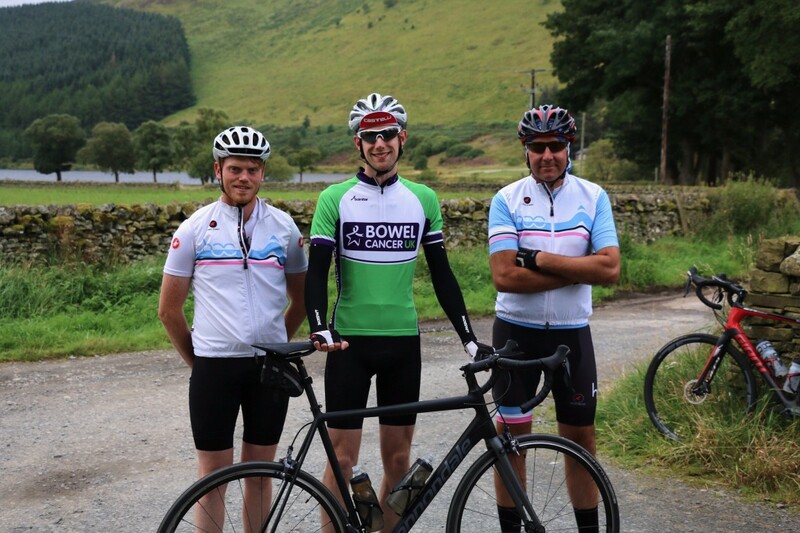 I am really proud to support Bowel Cancer UK, and any sort of fundraising challenge in memory of a loved one is really beneficial to everyone involved. I would encourage anyone to push themselves that wee bit further and go for it. If David has inspired you to take up a challenge then do take a look at our fundraising page.